In the coming weeks, a hundred random citizens will receive a letter in the post, blazoned by the golden harp of the State and requesting their membership of a “Citizen’s Assembly”, to meet on October 15th for the first time to engage and shape a report that will be put before the Oireachtas, facing up to one of the thorniest issues in Irish society: should the 8th amendment be retained, reformed or repealed? I believe it should be repealed and I took part in the annual March for Choice on September 24th in Dublin. The Assembly is a cop out. Our politicians should not hide or avoid debating, tackling or addressing the issues we face in the democratically elected Parliament that we already have, especially an issue such as this that affects half the population on the basis of their gender alone. I want to deconstruct this issue, an issue that is not as black and white as the single sentence in our constitution that attempts to deal with it is. Whatever change is recommended, unless a full repeal is achieved, Ireland will continue to simply export this “problem” to the clinics of London and Amsterdam. 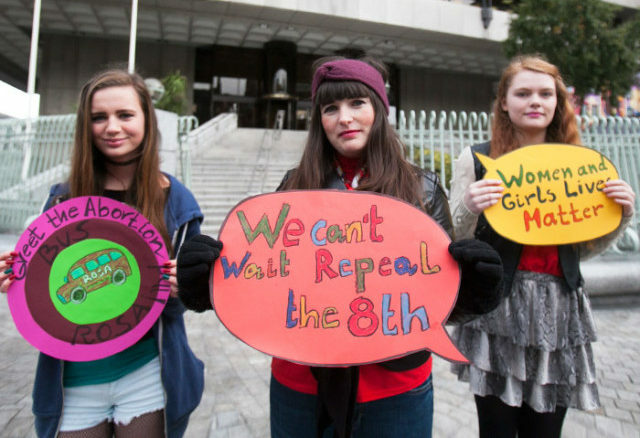 According to Amnesty International, vocal supporters of repeal and creators of the #repealthe8th campaign, 10 women make the journey every day. 4,000 from the Republic and 1,000 from Northern Ireland make the journey every year. The Repeal Project recently released a very powerful video entitled ‘We Face This Land’. Its message highlighted the point that abortion is accessible to Irish women, but only when they are forced to travel to foreign lands (albeit, not every woman can afford the luxury of foreign travel). The women in the video remark “a body is a body – not a house, not a vessel, not a city and not a country” and that “the laws of the Church have no place on your flesh”. I am glad the project drew attention to the origins of the 8th amendment, a regressive time when all laws in Ireland were the product of a fundamental lack of church and state separation. If we actually looked at the issue of abortion through the prism of fact, not through the dogmatic teachings of organised religious entities, we get a better understanding of how the current system in Ireland is problematic, unjust and discriminatory towards women. The Pro-Life Amendment Campaign (PLAC) was only established in 1981, to prevent an Irish equivalent of Roe v Wade appearing in our courts. This Catholic conservative fear of Irish women using the courts as a means to repeal the Offences Against the Persons Act 1861, is why a movement was spearheaded to deliver a full constitutional ban on abortion. The referendum on the 8th amendment itself in 1983, in which the Taoiseach of the day voted against, was passed by 66.9 per cent of the electorate with a weak turnout of 53.6 per cent. Roe v Wade is precisely why I am pro-choice and it forms the basis of my view that the 8th amendment should be repealed and that abortion should be allowed within the parameters of the law. It was a landmark U.S Supreme Court ruling in 1973, that legalised abortion in the United States. The Supreme Court found that a foetus cannot viably survive outside the womb during the first 23 to 24 weeks of pregnancy. Therefore, the foetus is not equal to human life at this point of the pregnancy. It is inaccurate to call abortion in that time period as “an act of murder”. A procedure to prevent a pregnancy reaching full term, when a foetus cannot survive outside of a womb, is simply not compatible to ramming a human being to death in a car at 120 km/h. Imagine being told that these are the clothes you have to wear, that this is the religion that you to have to worship, that this is the car you have to buy, that this the food you have to eat and that this is the house you have to live in. To have the law force a particular and subjective morality on you, against your free will, is exactly what the 8th amendment currently does to women and this totalitarianism is dangerous, wrong and obscene. Women should be permitted to exercise their natural right to choose whether or not they want to continue a pregnancy to full term and bring potential life into the world. Not the state, not the church and not anybody else in society.